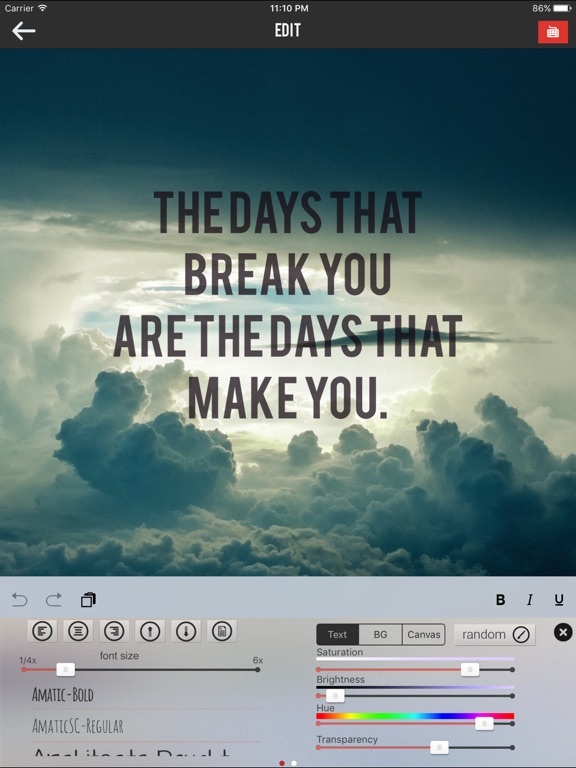 -Textograph Pro+ allows you to add most beautiful typography to your images, or simply turn your favorite quote in to a beautiful poster without adding any image at all. And share the result on Facebook, Twitter, Weibo ,iMessages, or simply save it to your photo library. 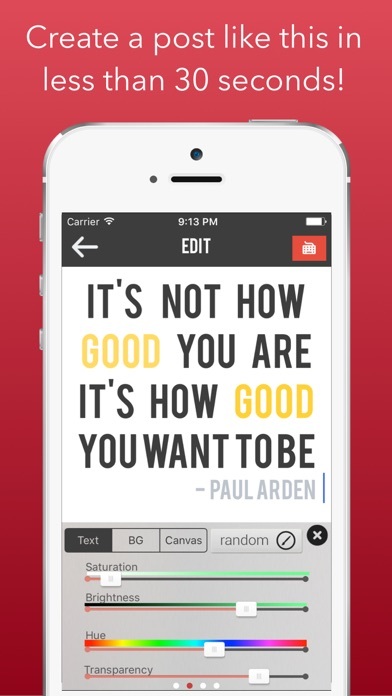 Textograph is not just another app which allows you to put text on images. 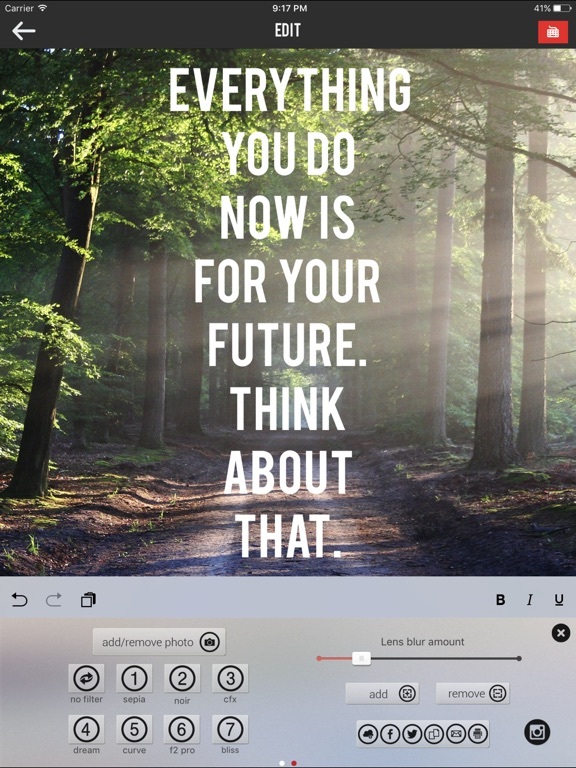 Textograph is an iOS exclusive amazing tool which is very simple and easy to use, but has very powerful features such as rich text editing, which let you create unlimited possibilities with texts. 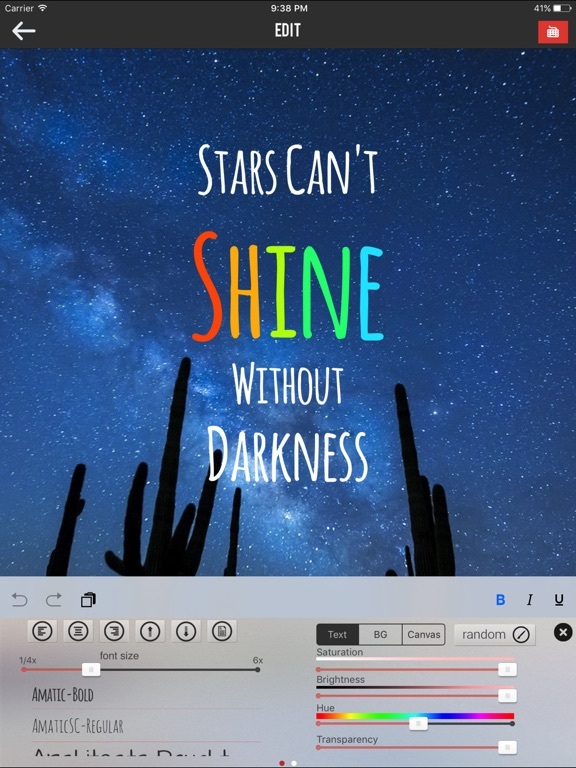 - Dynamic color slider which shows actual color when adjusting Hue, Saturation and Brightness. - When you tap on a text which already has a color, adjustment sliders will automatically snap to their correct values so you don't have to re-do all the hard work. - Above mechanism works for text color, text highlight color and also canvas background color! - Random color generator to make things quicker surprising. 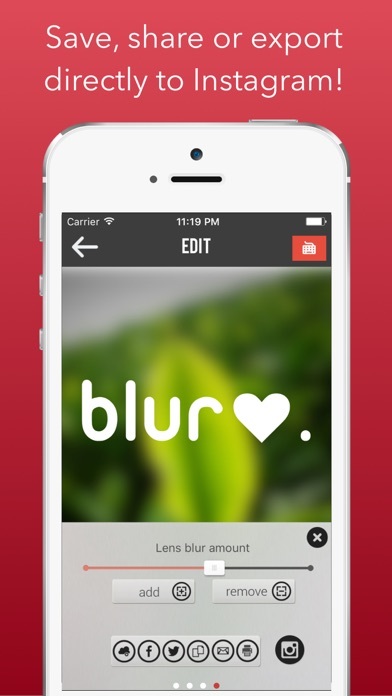 - Add a lens blur effect to your photos to make them look more stunning. 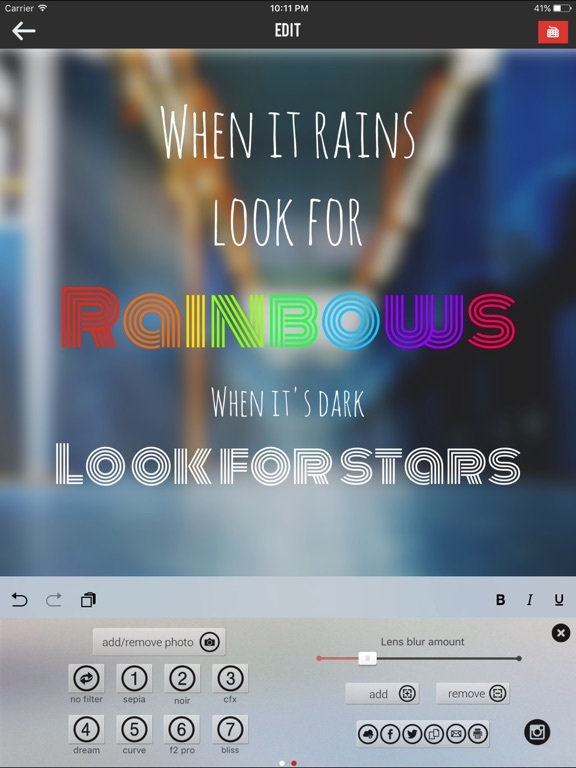 And adjust the lens blur amount. 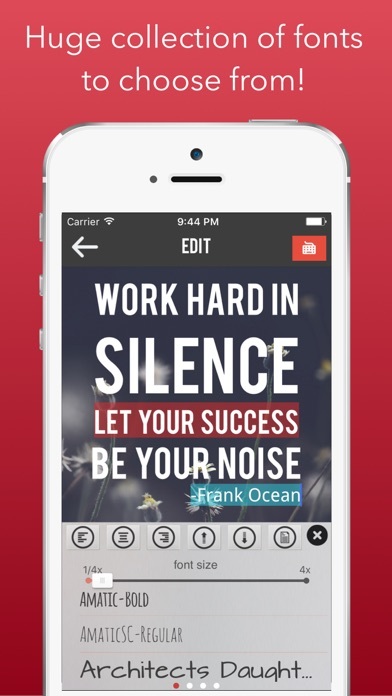 - This app can be used for AirDrop chat! Type anything you like and turn it into a picture which can be shared with AirDrop!!! - Textograph acts like your favorite rich text editing software! Available only on App Store. 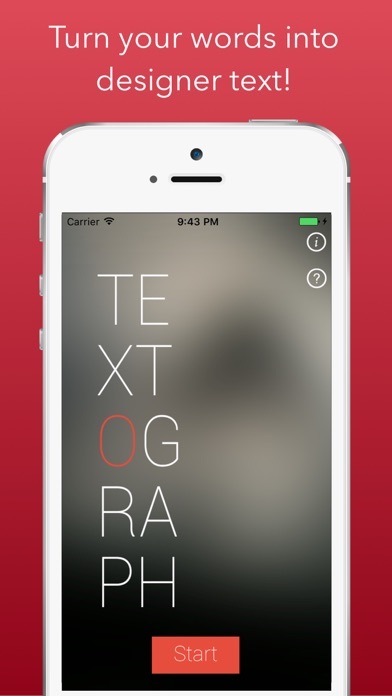 - Textograph allows you to change attributes of a text per character basis! Which means you can just select only a part of a text (or just a single letter) and set different font type, color, size , transparency , highlight color etc. Or all at once! - With Textograph, you can set each letter to contain different attributes(colors, sizes etc) on the same word or paragraph! That is an amazing feature which allows you to come up with unlimited possibilities. 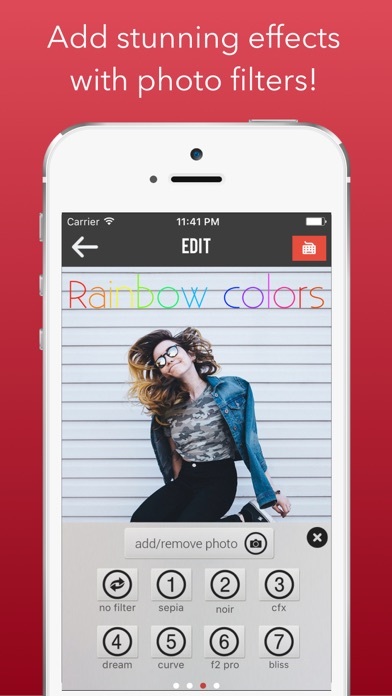 - Take a picture or import one from your camera roll and add beautiful photo filters available in Textograph. - Use over 85+ available fonts. - Share with your friends on Facebook, twitter, instagram, email, Message! 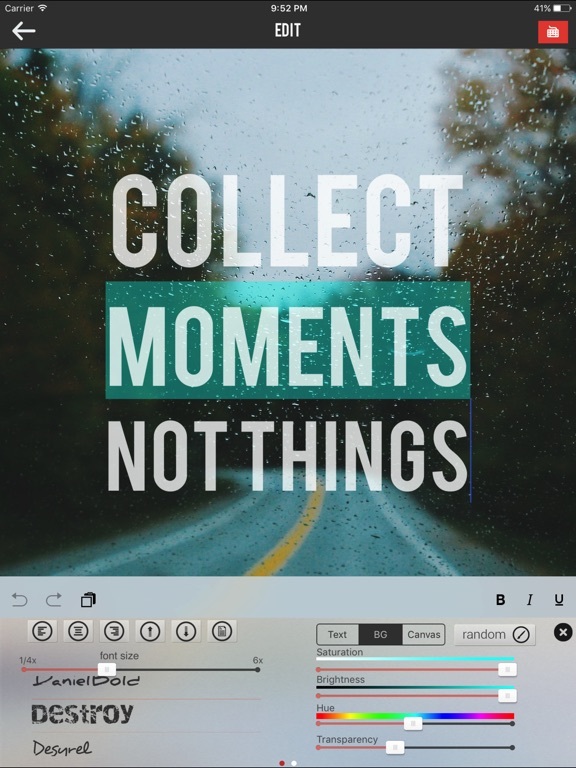 - Open output image in instagram and many other thirdparty apps! - No additional purchases at all.